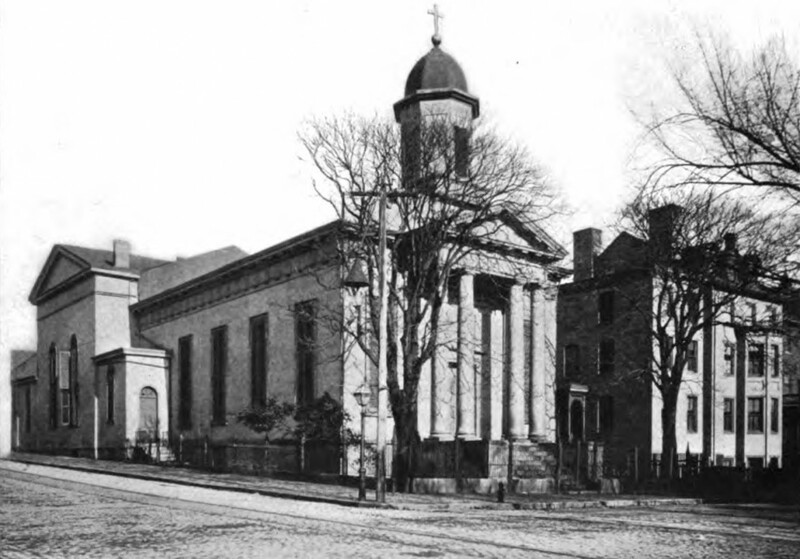 On May 25, 1834, Saint Peter Catholic Church was dedicated, becoming the first Catholic church in Richmond. After St. John Episcopal Church on Church Hill, the structure is the second oldest church in the city and the oldest to be built on Grace Street. Bishop Dubois secured the land at Grace and Eighth Streets, and Father O’Brien raised the funds for the building of St. Peter. The church was built in a neoclassic style similar to the Church of Saint Philippe de Roule, in Paris. St. Peter Church was named after the Prince of the Apostles, Saint Peter. The early congregation of St. Peter consisted mostly of Irish immigrants who worked on the canal. St. Peter served as the cathedral of the Catholic Diocese of Richmond until 1906, when the Cathedral of the Sacred Heart was consecrated. The church has a storied history. Among the luminaries who worshiped at St. Peter are John Banister Tabb, the Civil War poet whose thirty eight books comprised the collection of Richmond’s first public library. President John Tyler’s second wife worshiped and was buried at St. Peter Church, and her daughter was married in the church. St. John Neumann ministered to German immigrants in the basement of St Peter. Several of the church’s rectors became bishops elsewhere. Bishop James Gibbons, later Cardinal Gibbons of the Archdiocese of Baltimore, headed the Diocese of Richmond from St. Peter in the 1870s. His desk, which is estimated to be 150 years old, is still at the church. Today, St. Peter has approximately three hundred parishioners. St. Peter’s members are from all economic and social walks of life, particularly because the church is not neighborhood-based the way that most churches are. Many parishioners drive considerable distances to attend and actively seek out the small size and intimacy of the church. St. Peter is involved in several social outreach programs and also provides social outreach on an individual basis. St. Peter was one of the founders of the Downtown Community Ministries for the needy and homeless. Each participating church in the downtown area provides a meal and other services to those in need on a selected day during the week. St. Peter also helped found CARITAS. St. Peter cooperates with Richmond Social Services in providing emergency rent, medication, transportation and utilities to those in need. The Church is one of those on call for VCU Medical Center (MCV) through its department of chaplains or by private request. The church is listed on the National Register of Historic Places and the Virginia Landmarks Register. James Bailey, II. History of St Peter’s Church, 1959. James Bailey, II. A History of the Diocese of Richmond, 1956.